Ali and I sat on the porch for a moment this morning, enjoying the cool of the morning. “We would be watering now,” he said. I can’t recall if he bothered trying not sounding smug. After watering our potted plants and the greenhouse this morning, I went down to the bottom terrace of the garden to pick some tomatoes that had ripened, weeding as I went. I have been hopping from foot to foot waiting for a bowlful of tomatoes (as opposed to a handful). On the way down, I stopped to say good morning to the chicks, out for their morning scratch-around (we let the chicks out in the morning because the bigs stay in the coop all morning and come out in the afternoon after they have laid). 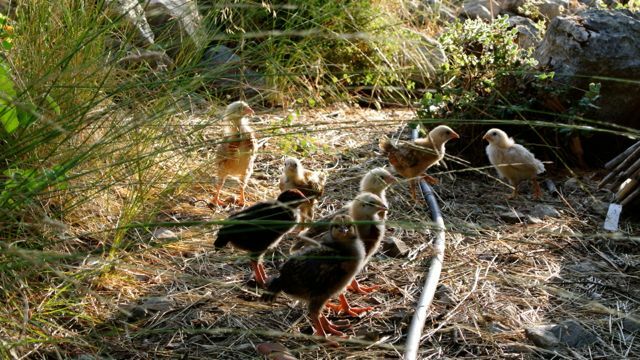 Yes, we finally have some chicks. I kept thinking and thinking that the hens were broody but they never were, and finally after I had given up all hope one of them sat down for three weeks and the result is 8 chicks, hatched in the dead of summer. 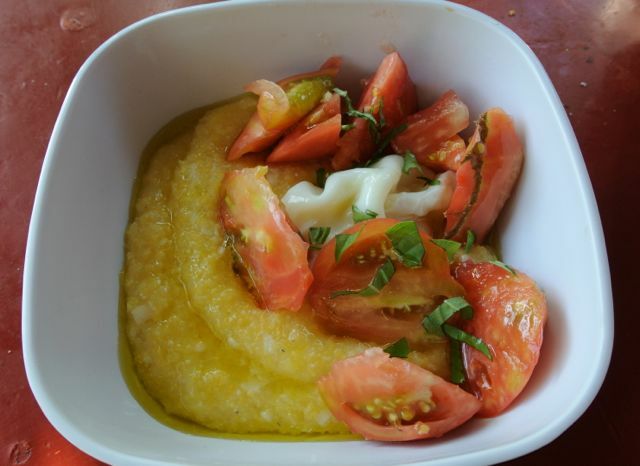 I got my tomatoes (a heavy bowlful — yay! ), as well as a few sprigs of basil, and headed back up to the kitchen. On the way up, I noticed that the beans are flowering (and beaning) again. 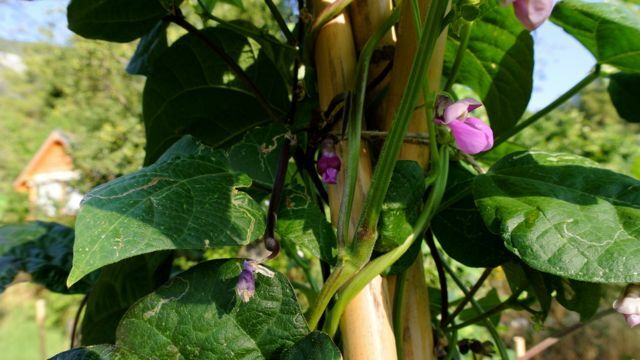 This is Trionfo Violetto, a purple pole bean. 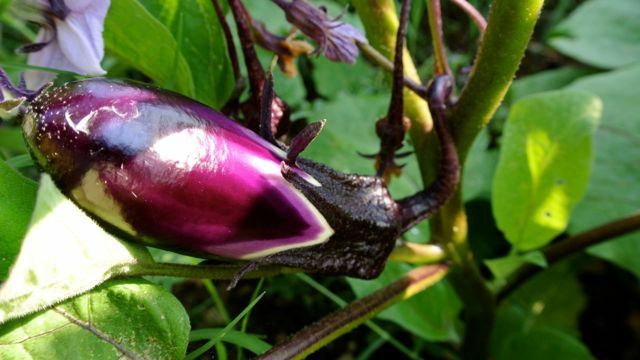 And I took a peek under the eggplant leaves and was encouraged by what I saw. Bring the liquids to a boil and pour in the polenta while whisking. Cook slowly, whisking to avoid lumps, for about 10 to 15 minutes. Stir in grated cheese and spoon a generous amount into a bowl. Add a cut up tomato, a poached egg, some basil, and a generous drizzle of olive oil. That’s a Brandywine tomato, which I am growing for the first time this year. I know, Brandywines are Heirloom Tomatoes 101, but for some reason I never tried them. Well, they are firmly on the roster now. Now I see what all the fuss was about. Ali was dismayed to catch my photographing his breakfast; it nearly put him off eating it. He relented, though — and then announced that he was getting a little tired of polenta. Herb flowers- these are oregano. 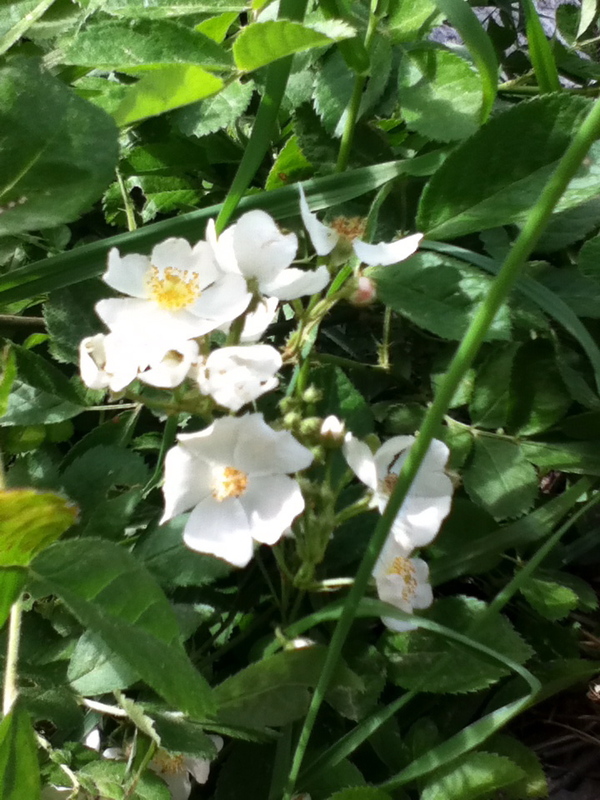 They grow wild in the garden and are a great favorite with the butterflies. Simmer for five or ten minutes and let it cool. Compote is nice chilled- it’s quite refreshing on a summer day. Bits of cooked fruit in a light syrup- it goes down pretty easy. It might seem like food for invalids, but since an invalid would require comforting, nourishing fare, perhaps that’s not such a bad thing. Thyme flowers would be nice, in fact that’s what gave me the idea: I was reading a book called Mes Tartes by Christine Ferber, whose book, Mes Confitures, is my current favorite jam book (although the titles are French, these are English translations, by the way). Her tarts are quite intimidating sounding and I have not attempted one yet. (I’m sure I’ll do it when my mom is with me in the kitchen this summer.) 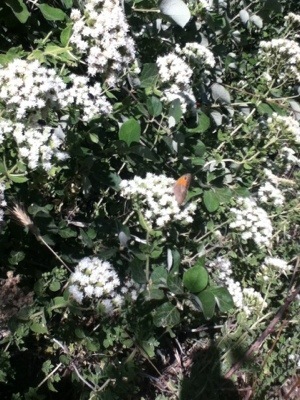 She had one tart, though, involving apricots and flowering thyme. That thought stuck with me. When Ali brought a handful of the last, almost overripe apricots from the tree at the bottom of the garden, I mixed them with peaches from the tree by the kitchen, which have been falling even though they are slightly underripe (the whole kitchen area smells like peaches now,as the fruits ripen). I thought the result was quite tasty. The flowers taste like oregano, of course, but there is also a distinctly flowery flavor to them as well. It has made me curious about other herb flowers. I’ve not cooked with lavender much, for instance, but I’d like to. This is the result; but first, some back story. We began work in this garden four years ago. It seems like ago, although it has passed by quickly, but it is not all that much time when you think in terms of trees. With trees, time stretches out before you in decades because the steps that trees take are big long steps that span years. Kaya, on the other hand, takes little steps, so that from one week to the next he is quite a different little fellow. When we first got here, we had to plant a tree a week. This is because we used a dry, sawdust toilet. Now, most things that I do are driven by necessity, not ideology. We use solar electricity because there is no other kind where we are, for example, not because we are great green giants. But one thing that I do get sort of driven about is water. And although I am not evangelical about it, I disagree with the notion of using water to transport human waste. Overall, although it is stinky stuff and can be full of ick, I can’t see why we don’t face up better to our own excrement and the disposal thereof. To this end, when it came to our toilet, I put my foot down and said no to the septic tank. This left us with the problem of what to do with our buckets of waste. (They were not as stinky as they might sound, as we used sawdust to bury any deposits, but full is full.) Our answer to this weekly dilemma was to dig extra deep holes when we planted trees and simply empty the buckets into them. A layer of dirt and a tree later, we could consider our toilet flushed. Over the past four years, as you can easily calculate, we have planted a number of trees. They seemed to like the arrangement just fine. 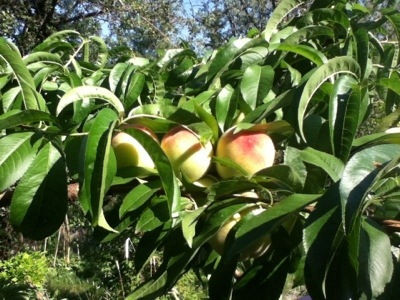 We have not had a huge amount of fruit from these trees, as anyone who has planted little saplings will know. 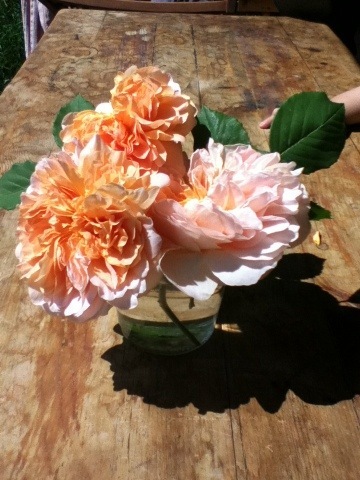 The first year, I dutifully plucked all the flowers off of the trees. 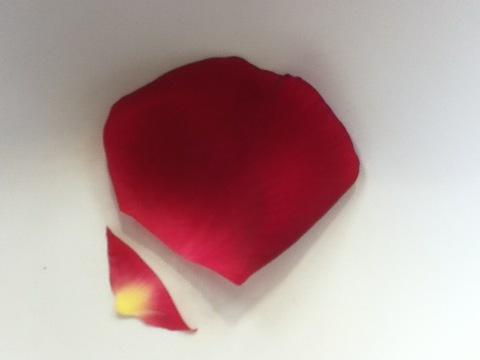 The next year, they bloomed like crazy and I rubbed my hands greedily. 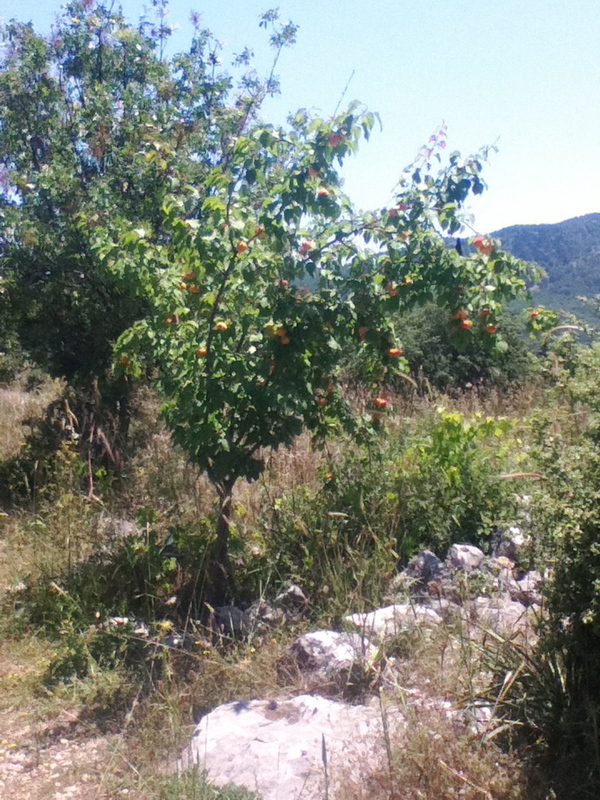 Then all the flowers fell off on their own and we had harvest like this: one sweet red cherry, one jujube, two apples. That is when I learned that plants really won’t be convinced to do anything they don’t want to do. If you want them to do something, you have to make them want to. And a young fruit tree is interested enough in thriving that it will not set more fruit than it is ready to, or at least the ones in our garden won’t! 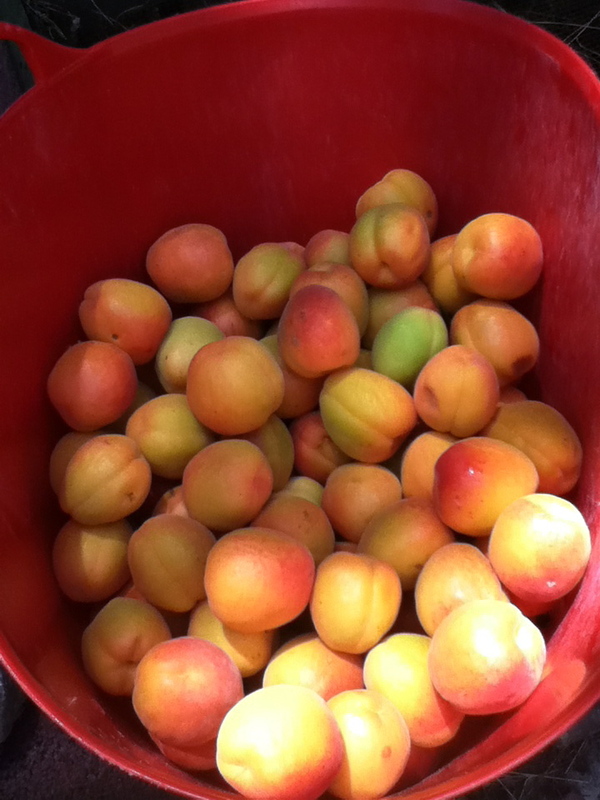 I picked some of them before they were, strictly speaking, very ripe, but I didn’t want the bugs to get into them, and my mother had mentioned that she would like the apricot jam to be not too sweet. I have made jam with half of them, and it is tart, so she ought to like it. 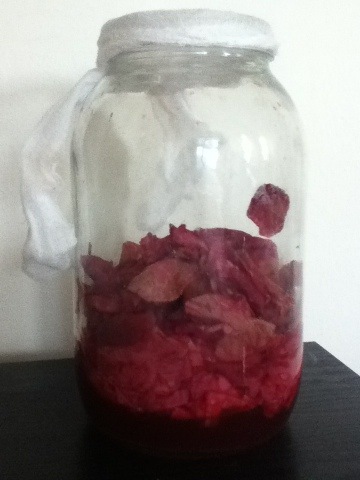 With the rest I think I may try my hand a fruit leather. These are tasty apricots, but not crunchy, which is how I prefer to eat them. 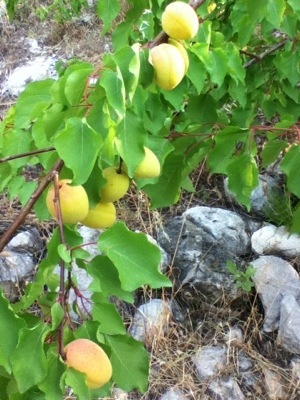 We have a crunchy apricot bearing tree at the top of the garden, by the road, but those fruits are still green. My first overabundance of fruit. A sweet predicament! A little while back, the amazing Celi at the Kitchen’s Garden wrote this post about what’s what in her garden. And in her typically generous manner, she invited us to show her what we her readers are up to. It’s not all that grand and I shot these with my iPod because I hadn’t found my camera yet (but I found it today, at a baby’s birthday party, while rummaging in the deepest recesses of my bag for a diaper) but even so, here’s what’s coming up round us. We are on a mountainside, so our garden is on a steep slope that is terraced (not our doing), and each terrace has a (not very poetic) name. 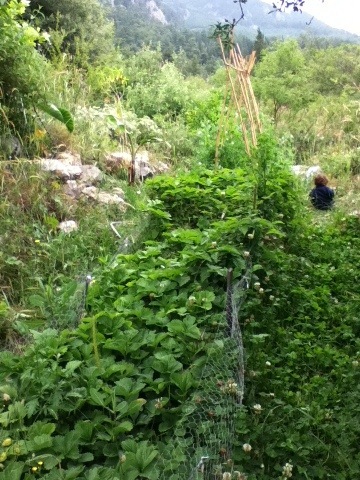 That’s the strawberry patch in the foreground with the pea trellis behind it. (This is the cucurbit terrace because I grew cucumbers and squash here the first year we were here.) 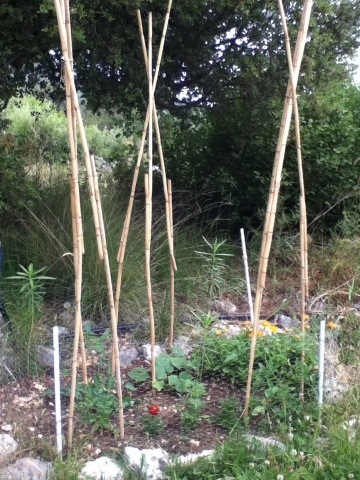 As you can see, if you are familiar with the trellis, there’s a lot more going on there now. I’m especially excited about the purple ones. They’re snow peas. 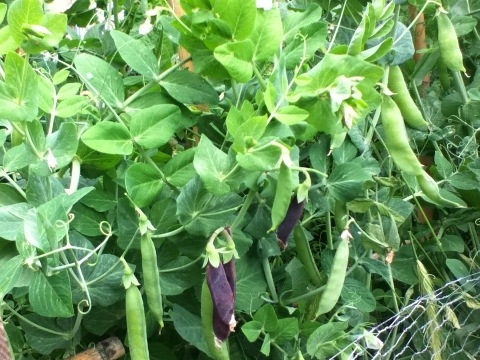 The others are shelling peas, a southern variety called Wando that is apparently on the heat resistant side. Those are the first tomatoes I planted out, and the early ones are fruiting, though hard as rocks and quite resolutely green. This is what we call the “vegetable bed terrace” because there are seven veg beds on it (only one raised bed) with a lotus pond in the middle. It’s a bit wild and wooly because of all the rain we’ve been having. This is Baki’s garden. It’s on the keyhole bed terrace, so called because there are three round beds there with another lotus pond in the middle. Right now the keyhole beds are pretty empty because I was letting a few things set seed and I just pulled them up. In Baki’s garden, we planted cherry tomatoes and cucumbers, with some marigolds (for color and bugs) and also something called fur balls. We’re not sure what those are, but Baki liked the sound of them. Down at the bottom of the garden on the old water tank terrace there’s a raised bed full of onions and these two: a mixed bag of greens and roots and behind that a tomato bed. That’s a red plastic mulch that I was curious to try. Ali is vehemently opposed, so I waited until he was in Istanbul to lay it down (though I told him I would, so it wasn’t subterfuge). That way, he needn’t feel any sense of complicity. Anyway, the red mulch is supposed to increase tomato yields as well as suppressing weeds and retaining moisture. Worth a try, I thought, in the spirit of inquiry. 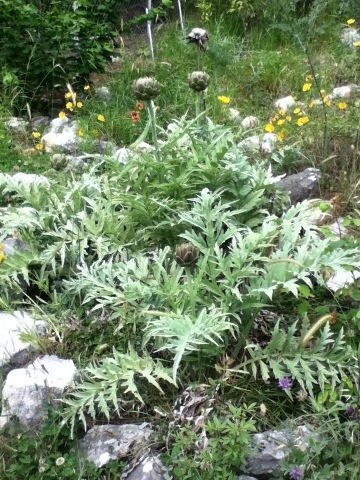 That’s one of the artichoke patches (there are three at the moment). 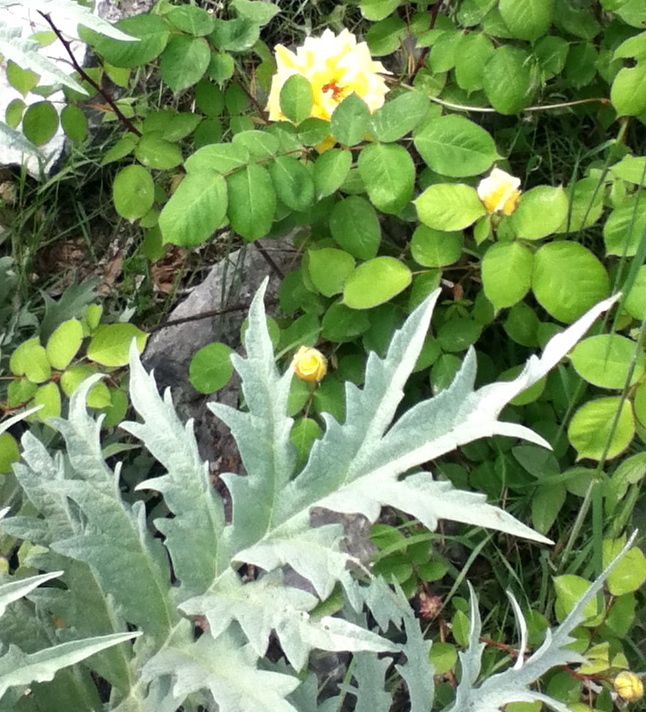 Artichokes are one of the few vegetable plants that Ali favors, largely because they are perennials. If you are also interested in perennials, there’s a great book called Perennial Vegetables by Eric Toensmeier that’ll get you all worked up. 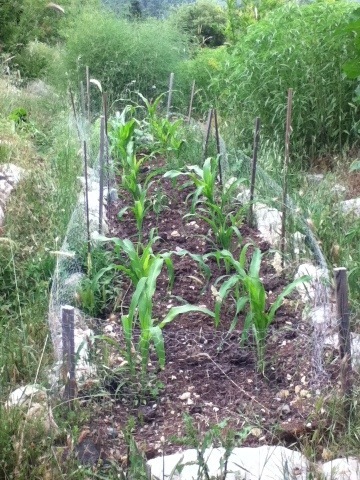 This is the first of three corn beds that I planted. This one is Country Gentleman sweet corn and that’s the asparagus gone crazy behind it. 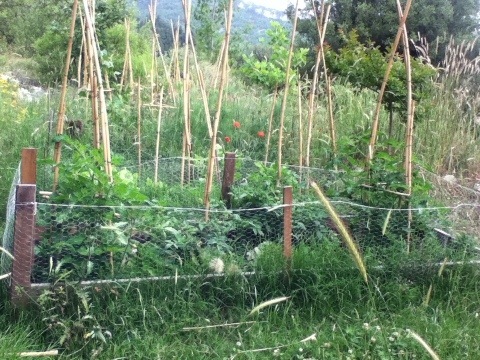 On the right side is the Maxmillian sunflower hedge. They are real survivors, those guys. It’s a perennial sunflower that blooms at the end of summer. 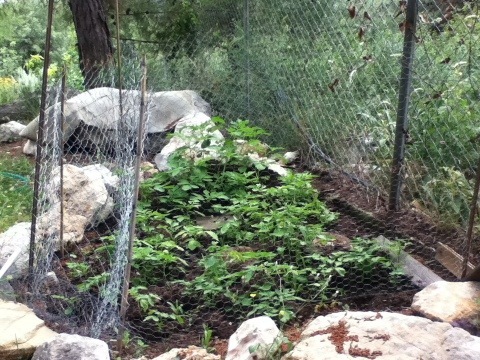 Our potatoes are growing on the site of our compost heap from two years ago. It’s a little shady, but they seem happy enough. 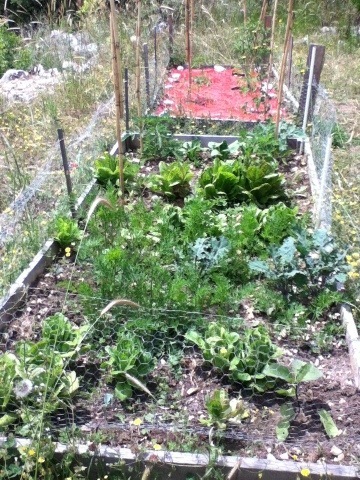 And that’s a look at our vegetables! When there’s more going on in the lotus ponds, I’ll take some pictures. At the moment, there are mostly frogs in the ponds now, and this may be why we’ve had a sudden explosion in the snake population in the garden. Ali and I have seen vipers slithering off in the vicinity of the ponds, and Baki encountered a garden snake on the stairs. And so I leave you with this deeply enjoyable poem by Emily Dickenson full of surprising pleasures (“unbraiding” just kills me, it’s so deft). It sums up the shivery thrill of our encounters. 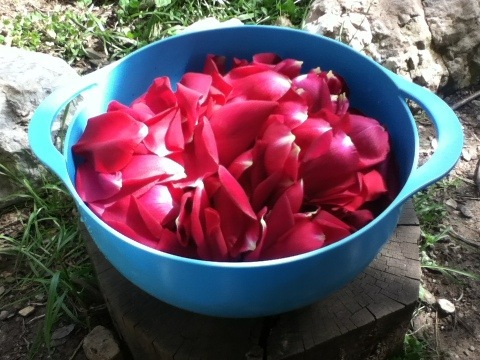 While the rose petal elixir is maturing, here’s a peek at a few other things happening in the garden. 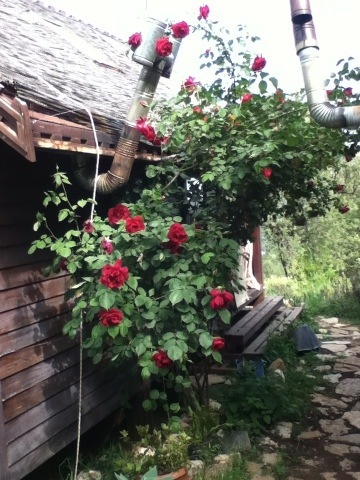 The climbing rose next to the greenhouse is starting to bloom. It’s a relatively recent arrival, so it is not the spectacle that the red rose is, but I love the flowers- they look like petticoats. 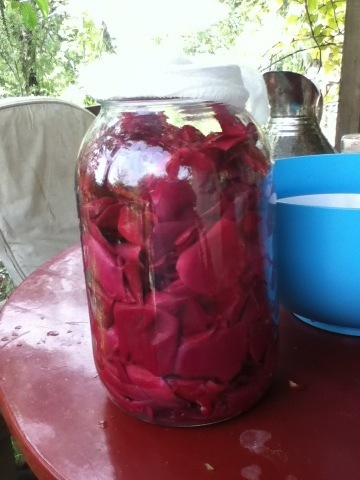 The roses were promptly whisked away. 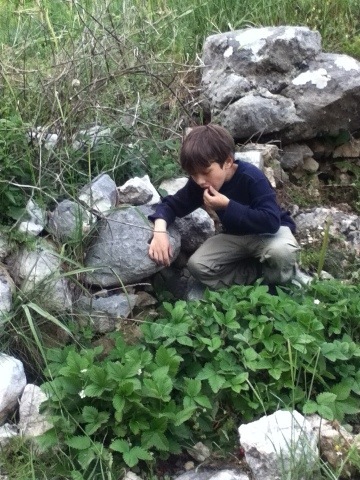 Kaya had his first taste of wild strawberries over the weekend. Wild in the sense of being small and fragrant, but not literally wild; we started them from seed a few years back, and they’re doing well. Kaya was very enthusiastic, which drew Baki’s attention, and he made sure we didn’t leave any behind. 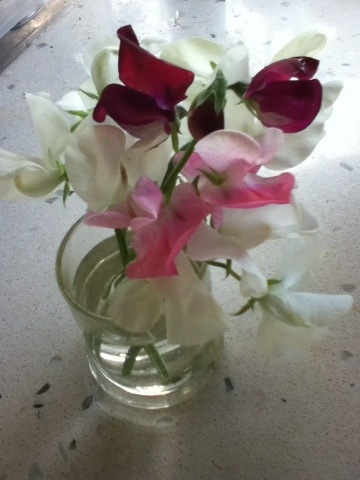 Another pleasant surprise was the sweet peas. Sweet peas are a sentimental favorite of mine, because it was my nickname as a baby. Still, despite my mother’s and later my own enthusiasm for them, I was for a long time quite unaware of the lovely scent of some of the older varieties. My mother and I found ourselves in Kew Gardens in June of 2004 and caught wind of a beguiling scent as we strolled beneath wooden pergolas. Following our noses, we were bowled over when they led us to sweet peas. 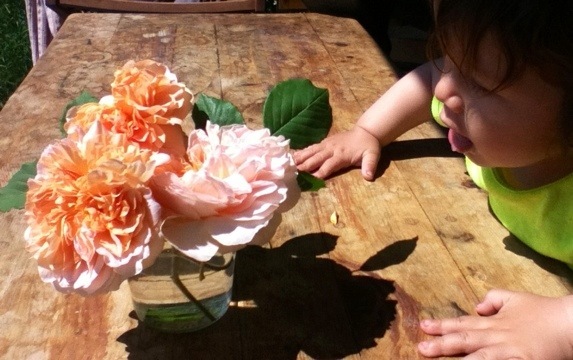 I’ve grown them every year since, and I’m always careful to choose scented varieties. These ones self-seeded, so they were unexpected. At this time of year, the garden is just one surprise after another. Spring is wonderful because it is full of flowers that are brave enough to push up and bare their faces to the chilly days. They dare us to forget the dark winter months, and how could we not in the company of daffodils? Some flowers, though, wait until the season is well underway, even turning slightly sultry. 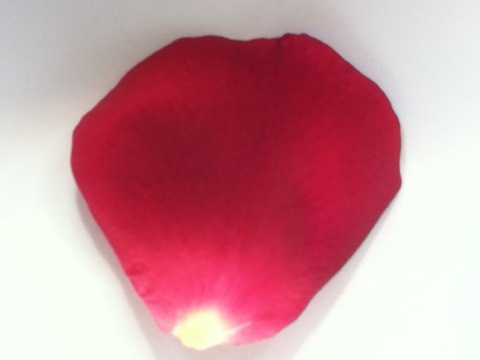 When I see roses, I know that things have finally started to heat up and Summer is on its way. Then I begin to panic at the number of seedlings still in the greenhouse, and I wonder how much longer I can grow lettuce without it wanting to bolt immediately. We have a more or less year-round gardening season, because our winters are quite mild. The summers, however, are relentlessly hot and dry, so they are the real challenge. There are many plants that will just grind to a halt when it gets much over 90 F, and lettuce won’t even germinate once the soil gets too warm. Now that we have daytime temperatures in the 80s, it feels like the clock is ticking. In a couple of months, we’ll be hoping for anything under 100! These days are a bit of a scramble. When we’re very busy in the garden, I like to make food I don’t have to think much about. Curried Beef and Tomato Noodles is a great favorite of Baki and Ali’s, and it’s a great way to stretch a small amount of meat (as I discovered when it turned out I had one small steak to feed three people). My mom used to make it all the time, and I’m pretty sure this is more or less how she taught me to do it. 1. Put the steak in the freezer. 2. Cook the noodles. If you can do this in advance, it helps- a few hours us fine, and overnight works too. Rice and noodles fry better when they’re not all hot and starchy. 3. Stir fry the noodles in batches in a big hot wok. To do this, get the wok hot and add about 2 T oil. Put in a third of the noodles and stir to coat in the oil. Let the noodles sit a while, so they get a bit browned. Stir them up again and then let them sit. Repeat a few times, then add about 1T soy sauce and stir it in for color. Put the noodles in a big bowl as you finish cooking them. 4. Get your steak out of the freezer and slice it really thinly- freezing it first makes this easy. Then toss it with the curry powder. 5. Chop the green onion into 1/2 in slices, greens and whites. Chop up your tomatoes too. 6. You are about ten minutes from done now. Get that wok hot again and add 1T oil. Stir fry the onions and add them to the noodles. 7. Put 1/3 of the seasoned meat in the wok and cook. Don’t forget to let it sit a little to brown it. Add to the bowl and repeat with the rest of the meat, adding oil as necessary. 8. By now the wok is probably a bit crusty. So tip in the tomatoes and stir them around to get all the bits off the wok. Let the tomatoes cook until they are saucy, then tip the whole big bowl of noodles and meat and onions and all back into the wok. Stir it all up and you’re ready to eat. These instructions may be a bit verbose, but it’s easy and it goes fast (frying the noodles is the longest bit). Kaya made a lunge for one of my noodles at the table, so I gave it to him and he frantically opened and closed his hands when he had finished. 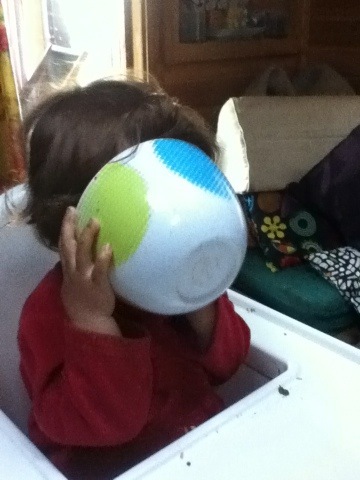 Baki took more than he could eat, so I let Kaya have his bowl. When he was done meticulously picking every noodle out, he stuck his whole face in. Another noodle fan in the family.